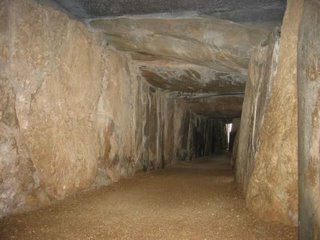 Although Spain is not traditionally known for its megaliths, it nevertheless possesses numerous dolmens, menhirs, cromlechs and other interesting prehistoric sites. Oldest Rock Art in Europe Discovered In Spain. 'Recent studies have shown that the 'Palaeolithic paintings in El Castillo cave in Northern Spain date back at least 40,800 years' -- making them Europe's oldest known cave art, according to new research published June 14 in Science. Hand stencils and disks made by blowing paint onto the wall in El Castillo cave were found to date back to at least 40,800 years, making them the oldest known cave art in Europe, 5-10,000 years older than previous examples from France. A large club-shaped symbol in the famous polychrome chamber at Altamira was found to be at least 35,600 years old, indicating that painting started there 10,000 years earlier than previously thought, and that the cave was revisited and painted a number of times over a period spanning more than 20,000 years'. 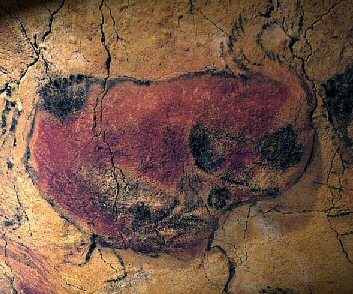 The Cave art at Altamira was the first ever discovered in Europe, so early in fact that unfortunately the discoverer was pilloried for the rest of his life as a charlatan. Today the artwork is recognised for its excellence, both in style, colour, and artistic technical expertise, but also because of the numerous animals that were painted into the natural 3-dimensional distortions of the ceiling, something which is only seen less than 20 caves in all of Europe. 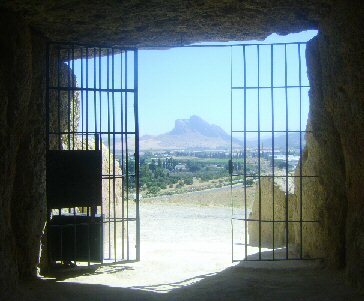 Cueva de Menga complex - Antequera. 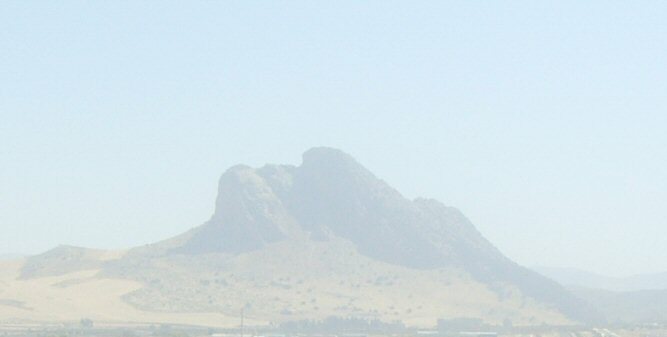 Cueva de Menga is the largest of three substantial passage mounds in the area. It is considered to be one of the largest such structures in Europe. Running twenty-five metres deep, five metres wide and four metres high, it was built with thirty-two megaliths, the largest weighing about 180 tonnes. Los Milllares – Neolithic Fortress. Extensive remains of a megalithic settlement/fortress were discovered, which include a vast cemetery, dwellings, metal workshops and several chambered mounds surrounded by stone-circles. The settlement flourished between 5,100 B.P. and 4,500 B.P. several 'Tholos' similar to those seen in Mycenaean Greece. The main site is that of a Neolithic walled Citadel and passage tomb cemetery, but there are 12 orbital forts and at least two other 'necroplis' on adjoining hilltops. The site includes several reconstructed parts. 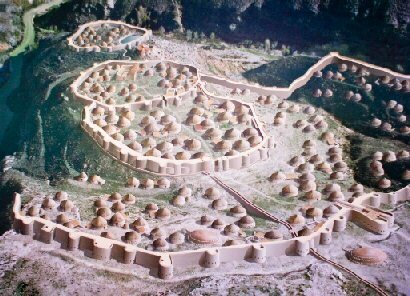 Neolithic complex with over a hundred known prehistoric sites in a region now divided by the Spanish/Portuguese border. 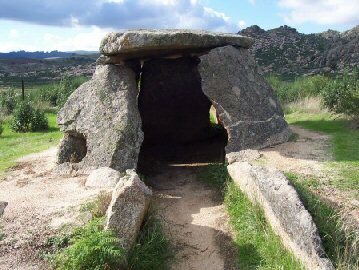 A few kilometres away in the Cáceres province of the Extremadura region of Spain 42 dolmen comprise one of the most important collections in Europe around Valencia de Alcántara. There are believed to be fourteen more whose location is no longer known. The tourist authority in Valencia de Alcántara have set up megalithic routes Ruta de los Dólmenes. Nearby and just across the Spanish border is the Menhir of Meada, the tallest single standing stone in the Iberian peninsular. Contains engravings on several of the orthostats. It was discovered by Don Armando de Soto in 1922. Is the more important prehistoric monument of the province of Huelva. The photo below is the enormous structure of the Soto dolmen in Trigueros, Spain, which has been returned to its prehistoric glory after a nine-year restoration. 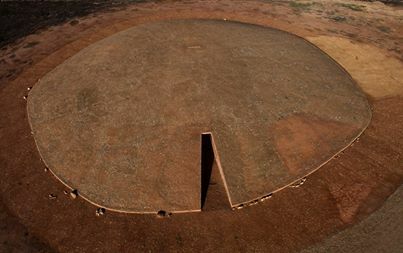 The mound is 60 metres across and 3.5 metres high, making it the largest of more than 200 dolmens, or megalithic tombs, that dot the Huelva province. The stones that support the Soto dolmen's interior were originally arranged as a Neolithic stone circle similar to Stonehenge, before being repurposed in this structure. When Don Armando de Soto uncovered it in 1922, he found eight bodies inside, posed in crouching positions near the wall and surrounded by stone utensils, pottery and decorative items... More soon. Altamira Caves. Oldest European Cave-Art. Cueva de Menga. Three large passage mounds. Extremadura Megalithic Region with over 100 sites. 1). M. D-A Garcia, S. J. Keay. The Archaeology of Iberia. 1997. Routledge.